Caps are stocked in Black and Red, but other end-cap colors can be produced. 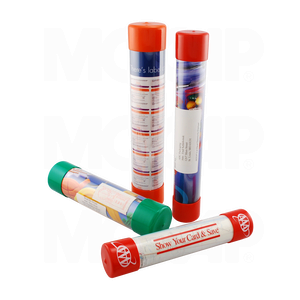 Weatherproof and durable, our vinyl caps are the suggested closure for our clear plastic mailing tubes. These caps are stocked in red and black, but other colors are available if time permits. Produced using our heavy wall clear plastic tubes, customization of the diameter and length is also an effective way to create that special mailing. United States Postal and UPS approved. Plastic tube and vinyl cap closures offer water resistance. In addition to plastic mailing tubes, Cleartec Packaging also manufactures and supplies ultra-thin, thin wall, heavy wall, sealed bottom and hanging plastic tubes and containers.